NB. Joseph Bourne & Sons acquired the Eastwood Pottery, Nottinghamshire (founded in 1881) from Messrs. Mellor, Jepson & Mellor in 1891 and traded as Bourne Eastwood until 1908. 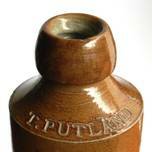 This bottle therefore dates between 1891 and 1908.